The Capitol has both permanent and temporary art displays. On the lower floors of the Capitol and Legislative Office Buildings are photographs from Florida's history. These images from Florida's Photographic Archives are on permanent display. They were chosen and placed by the Florida Legislative Research Center (FLRC). The rotating art display areas within the Capitol grounds include the 22nd Floor Capitol Gallery, the Cabinet Meeting Room and the Gallery at the Historic Capitol. The Capitol Gallery and Cabinet Meeting Room are managed by the Florida Division of Cultural Affairs, which is part of the Florida Department of State. Cultural Affairs maintains an exhibition calendar on its website. The Historic Capitol Gallery is operated by the FLRC. Information on the current display is available at the FLRC's website. Former House Speaker and Governor W.S. 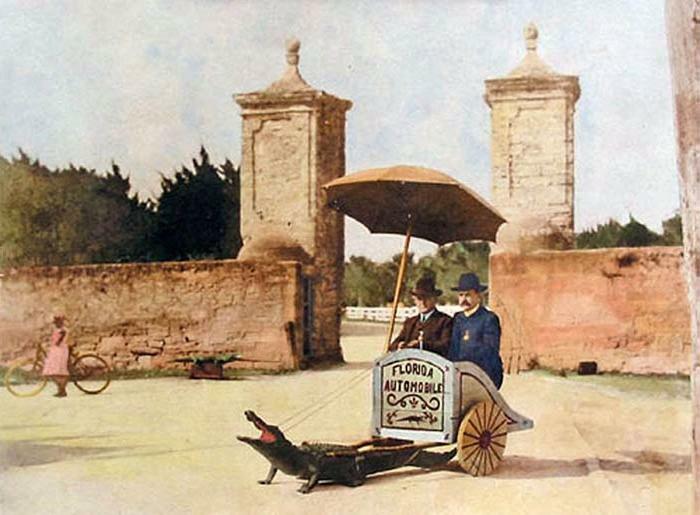 Jennings (D – Hernando County) (right) is shown here in an alligator cart by the St. Augustine city gates while he was Governor between 1901-1905.